Looks great, performs well, slim profile so takes up very little space. The modern design looks very stylish, and overall construction is great - the NN-CT562MBPQ feels very sturdy. The door and interior of the NN-CT562MBPQ can get pretty hot during use of the combi oven - be careful to avoid burning yourself - however this is a standard issue for the vast majority of microwaves, and not one which can be avoided unfortunately. The NN-CT562MBPQ combi microwave from Panasonic offers a lot of features from it's relatively small body - a 100-220 Celsius convection oven, together with a 1300w grill combined with a 1000w microwave. At first glance the NN-CT562MBPQ appears to be a well designed and versatile cooking machine, with a stylish design which will grace the modern kitchen. The slim profile of the Panasonic NN-CT562MBPQ makes it ideal for those where space is of a premium, and it's three in one cooking facilities is handy for people without access to a regular oven and grill combination, or for those who wish to save on energy bills. A combination oven typically uses far less electricity than the standard convection oven, and so in the long run will save you money, as well as being far more environmentally friendly. Unlike many cheaper models we've used, the NN-CT562MBPQ heats food evenly, with no hot or cold spots during our test. Despite the relatively small exterior dimensions of this microwave oven, it is tardis like in the sense it has a deceptive amount of interior space - a huge 27 litres, with the interior measuring 35.9cm by 35.2cm by 21.7cm in total. This was more than substantial for all of the dishes we tried inside - so you shouldn't have any issues with your favourite large dishes. The fan has been moved from the regular position at the back of the microwave to the top, which helps reduce the amount of room the Panasonic NN-CT562MBPQ microwave takes up on your work surface or shelf. 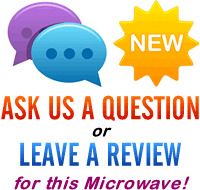 The provided instructions are in depth and make it easy to operate this microwave, although you may wish to experiment with cooking times - as with most microwave ovens, this varies based upon the container you have the food inside. In terms of handy features, the NN-CT562MBPQ provides several auto cook and reheat options, giving you the option of selecting a food type and weight, to eliminate over or under cooking a dish. In practice our testers found the Panasonic NN-CT562MBPQ's auto cook options to be surprisingly accurate, and a useful addition to the menu options. At the risk of stating the obvious, the interior sides of this microwave get pretty hot during use of the oven facility - so bear this in mind when using this appliance to avoid burning yourself. This is standard for all combination microwaves, so we can't fault the NN-CT562MBPQ in this area. The Panasonic NN-CT562MBPQ controls are easy to use, and none of our testers experienced any issues when operating the combination microwave or grill. Given the 27 litre capacity, the NN-CT562MBPQ is best suited to larger households, although the compact design means it will also be ideal for those where space is of a premium. Essentially it's a compact combi microwave, which doesn't compromise on either build quality of performance, and the versatility with helps save money from your energy bills. 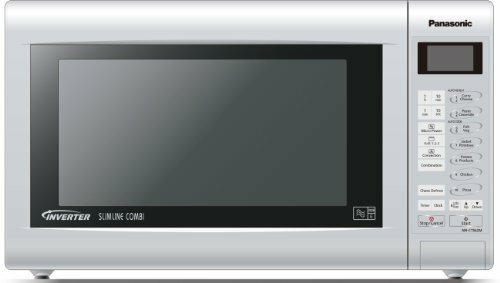 Overall this silver microwave feels solid, looks stylish, performs beautifully, and we'd highly recommend it to our readers. It's not the cheapest combination microwave on the market, but our test team feel that the Panasonic NN-CT562MBPQ offers excellent value for money, and will be a handy addition to your home. If you're looking to buy a reliable yet stylish combination microwave, then the Panasonic NN-CT562MBPQ offers good value and performance, and comes highly recommended. Build quality is excellent, and the touch controls are very well labelled. The slimline nature of the Panasonic NN-CT562MBPQ means it takes up less space than the average combination microwave, yet still provides a spacious 27 litre interior. If you're after a compact mid sized combination microwave for your home, then the NN-CT562MBPQ offers excellent value for money, and won't disappoint in terms of performance.